I’ve had the privilege to interview Disney Legend and composer Richard Sherman who along with his brother, Robert Sherman, made up the prolific song-writing team responsible for over 1,000 songs across a 50 year career. During their 13 years at Disney (1960-1973), the Sherman Brothers received four Academy Award nominations (and won two for Mary Poppins) and composed 200 songs for 27 films, two dozen television productions, and scores of theme park attractions. However, while the Shermans created happy and cherished family songs in the American canon, the brother’s personal lives could not have been farther apart. 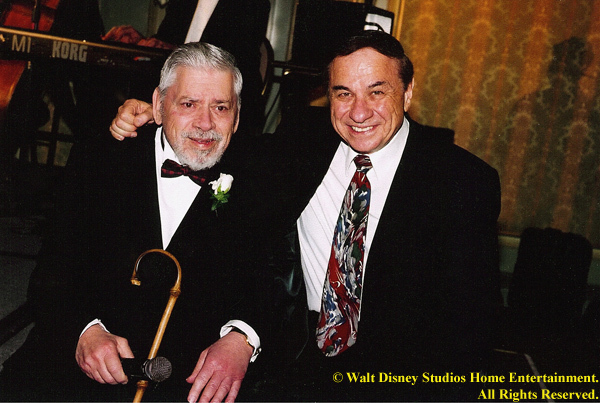 In their film “the boys: the sherman brothers’ story”, filmmakers and cousins Gregg Sherman (son of Richard) and Jeff Sherman (son of Robert) sought to understand the conflict between their fathers and put a face to the music known to so many. Continue after the break to read and listen to my interview with producers and directors Gregg and Jeff Sherman as they discuss their fathers’ relationship, the making of the film, and the music that made “the boys” famous. Their film is an incredibly powerful and moving picture that, at times, felt like a family therapy session. The idea for “the boys” began at the London opening of Chitty Chitty Bang Bang in 2002. Both Gregg and Jeff attended the premiere, and sat with their fathers and respective families on opposite sides of the theater – not an uncommon occurrence at these events. They had grown up a mere 7 blocks apart yet their families never saw each other, and the cousins barely knew each other. However, on that particular night in 2002, the cousins finally struck up a conversation and asked, “What happened that our Dads wrote foremost family music, but we cannot get our families together?” From that simple question came the desire to delve further into their family history, and the idea for the film grew. During their research, Gregg and Jeff learned the simple truth that their fathers were very different people. Richard Sherman grew up wanting to be a composer and to share the music in his head with the world. Robert Sherman wanted to be a writer producing plays, short stories, and poems. After Robert returned from serving in the Army during World War II, Al Sherman (the boys’ father and successful songwriter in his own rite) challenged the two of them to write a song together. Once paired together, the brothers discovered a chemistry and created songs neither could have produced on their own that have stood the test of time. 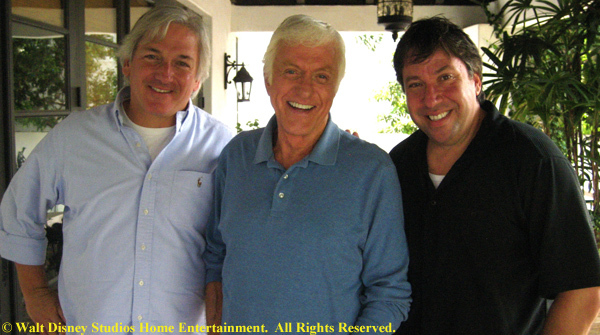 Gregg and Jeff hoped that in the process of making the film they would be able to bring Richard and Robert Sherman closer again. While they did not succeed in that goal, the film may have helped Richard and Robert understand each other better. “They are kind of set in their ways, but deep down they do love each other and respect each other as creative people,” remarked Jeff. While Richard and Robert were only two and one half years apart in age, in many ways the brothers were of different generations. Robert Sherman’s experiences during World War II profoundly influenced him, and ultimately distanced him from his brother. “When you see the darkness of humanity, it’s going to change you,” Jeff said of his father. 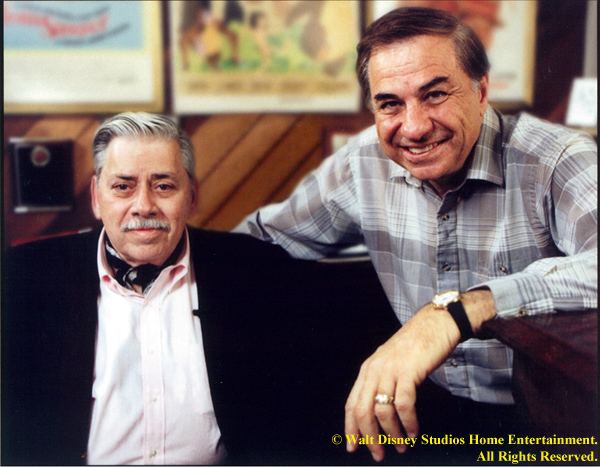 However, as important as it was for Gregg and Jeff Sherman to build a bridge between their fathers, it was equally, if not more, important to connect the Sherman Brothers’ legacy to their body of work. As you watch “the boys” and hear the familiar songs packaged together, you start to identify the characteristic traits of their work such as imagination stretching word play like supercalifragilisticexpialidocious (Mary Poppins), Higitus Figitus (Sword in the Stone), fundamental-friend-dependibility (Snoopy Come Home), or gratifaction (Tom Sawyer). 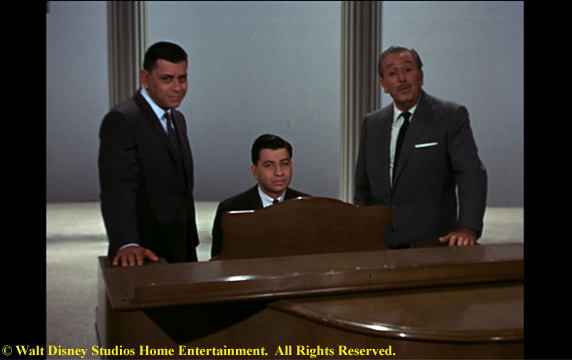 The Sherman Brothers songs are simple, singable, and accessible, and were all started first with an idea. The film also highlights the approach they used to create songs and what made them resonate lyrically and musically. Jeff Sherman expanded, “these are really well thought-out, well crafted songs by two, we think, geniuses that were able to combine their talents and make something better than either would have done on his own.” As Robert Sherman said in the film, these are not “kiddy songs”, for if they were they simply would not have lasted. I commend Gregg Sherman and Jeff Sherman for reaching out to each other instead of continuing to sit on opposite sides of that theater, and trying to understand the source of the difference and conflict between their fathers. We are the beneficiaries of their work and struggle, and I thank them both for sharing the Sherman Brothers’ story with the world. I thank Gregg and Jeff Sherman for taking the time to speak with me. 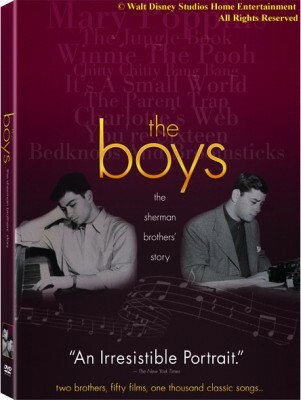 Their film “the boys: the Sherman brothers’ story” is now available on DVD.